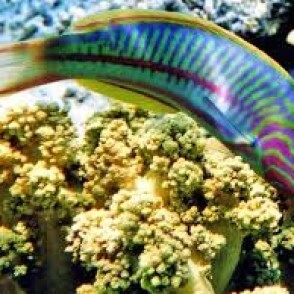 The Klunzinger’s Wrasse is a beautiful wrasse from the Red Sea that will add both coloration and activity to your marine aquarium. These wrasse can be recognized by their bright green and blue body with striking purple patterns throughout the body and head. 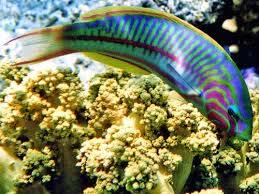 The shape of this fish is elongated which aids its movement throughout the reefs in nature. 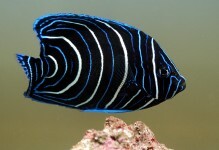 This hardy fish should reside in a 70-gallon or larger aquarium, with other aggressive tank mates, and plenty of rocks for hiding. 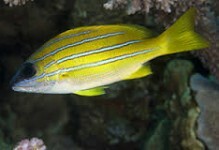 It will become territorial and often harass any new additions to the aquarium therefore, it should be one of the last fish added to the tank. 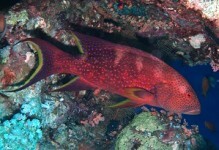 This species has been known to eat mantis shrimp and bristleworms as well as other crustaceans, but will normally not eat corals or live plants. 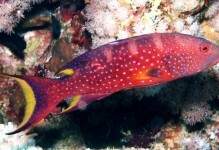 The Klunzinger’s Wrasse diet should include vitamin enriched frozen mysis shrimp, vitamin enriched frozen brine shrimp, and other meaty foods along with a high quality marine flake and marine pellet food.